Ratings agency Moody’s slashes Italy debt rating by three points, increasing pressure on European governments trying to contain financial crisis. Italy’s sovereign debt rating has been cut for the second time in as many weeks, with ratings agency Moody’s citing “sustained and non-cyclical erosion of confidence” as it slashed its forecast for the country. In a report released after US stock markets closed on Tuesday, Moody’s downgraded Italy’s government bond ratings from Aa2 to A2 with a “negative outlook”, suggesting further cuts could be to come. The move threatens to increase Italy’s cost of borrowing, and will add yet more pressure to European finance ministers now wrestling with a financial crisis that has spread across the continent. Italy’s prime minister, Silvio Berlusconi, criticised Moody’s rival Standard & Poor’s when it cut Italy’s credit rating last month, saying the ratings agency’s action was “dictated more by newspaper stories than by reality”. In its report, Moody’s said the decision had been driven by three main factors: the debt crisis, which was causing a “sustained and non-cyclical erosion of confidence” in Europe and increasing “long-term funding risks” for Italy; the increased downside risks to economic growth due to macroeconomic structural weaknesses; and a weakening global outlook. “The implementation risks and time needed to achieve the government’s fiscal consolidation targets to reverse the adverse trend observed in the public debt, due to economic and political uncertainties,” Moody’s said. Berlusconi again tried to play down its significance, saying “Moody’s choice was expected”. “The Italian government is working with the maximum commitment to achieve its budget objectives,” Berlusconi said. The move came at the end of a day when markets were awash with fears that €3.4bn (£2.9bn) of exposure to Greek debt would bring down Franco-Belgian bank Dexia and tensions rose across the banking sector, putting pressure on the European Central Bank to be more generous in loans to banks to prevent a rerun of the 2007 credit crunch. The gloom that has lingered over the banking industry since August deepened further when Deutsche Bank, Germany’s biggest, warned it would miss its profits target and the cost of insuring major US banks against default reached levels last hit in October 2008. Anders Borg, the Swedish finance minister, has been urging colleagues to prop up banks, possibly with public funds, even before the downgrade of Italy and despite fierce resistance from the French, who insist Europe is not at risk. Senior officials led by Olli Rehn, EU economic and monetary affairs commissioner, backed this stance, which is endorsed by Christine Lagarde, managing director of the International Monetary Fund. She has said up to €300bn in capital may be required. Comments by Rehn, reported after European markets had closed, that there was now a “shared view” of the need for co-ordinated action in banks helped to lift Wall Street off its lows to end the day higher. Italy last month approved a €54bn package of austerity measures aimed at eliminating the country’s budget woes and that it hoped would stave off a Moody’s downgrade. The pledge to cut government spending and raise taxes met with cautious approval from Brussels, the European Central Bank and the International Monetary Fund but has not appeased Moody’s. “Even if policy actions were to succeed in the short term in returning some degree of normality to euro area sovereign debt markets, the underlying fragility and loss of confidence is deep and likely to be sustained,” Moody’s said in its report. 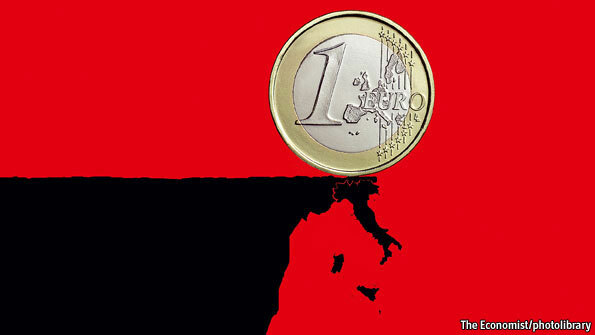 “The Italian economy continues to face significant challenges due to structural economic weaknesses. These problems — mainly low productivity and important labour and product market rigidities — have been an impediment to the achievement of higher potential growth rates over the past decade and continue to hinder the economy’s recovery from the severe recession it experienced in 2009,” said Moody’s. “These structural impediments to economic growth cannot be removed quickly. The government’s reform plans have only just started to address some of these structural challenges, and they need to be implemented efficiently. The downgrade may put more pressure on Italy’s banks at a time when they need to shore up confidence in the eurozone’s banks is increasingly recognised by politicians. Senior figures are pressing for stress tests for Europe’s banks to be brought forward from next year after Dexia passed the July tests with flying colours. Several officials in Luxembourg referred to Dexia as “the canary in the coalmine”. Borg, also a non-zone minister, was blunter. “Government support is the best kind of backstop,” he said. The head of the European regulator, the European Banking Authority, Andrea Enria, joined the chorus of calls to solve the eurozone crisis. “It’s a major issue that could go from Dexia to other banks, so it’s important this is fixed and the sooner it’s done the better,” said Enria, who oversaw the July stress tests on banks. Italy’s latest downgrade follows cuts for eurozone partners Spain, Ireland, Greece, Portugal and Cyprus.